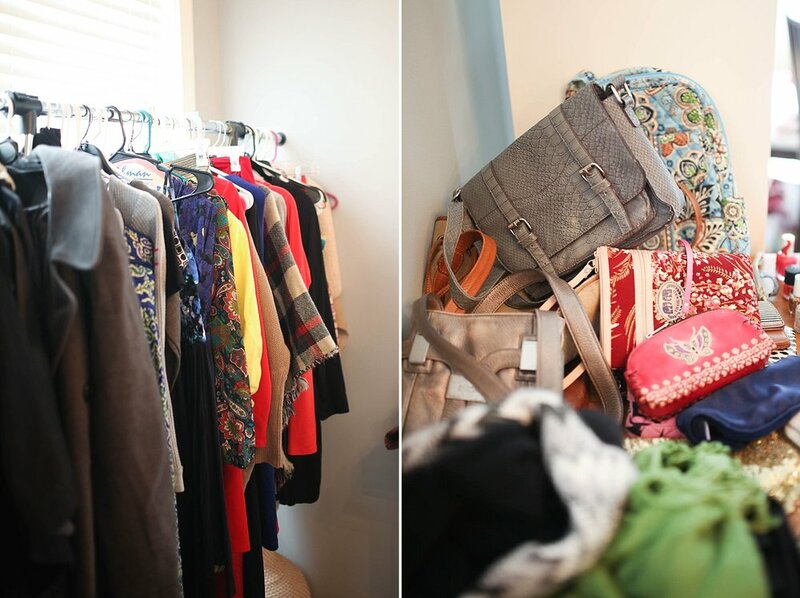 Last weekend, my friend Maria hosted her twice-yearly clothes swap party. She does one in the fall and one in the spring, and it's a huge hit every time. She invites tons of friends - everyone from her BFFs to her co-workers to her mom! - and everyone brings a bag or bin or in some cases, a giant suitcase, full of clothes they no longer love or wear. She serves brunch (people usually pitch in with baked goods!) and there are always mimosas. There's music playing and plenty of mirrors out for trying things on. All the clothes are piled onto tables or hung on a couple hanging racks, and everyone goes to town! I've heard of these swaps having "rules" sometimes, like you only take the number of items you bring, details on who gets to choose first, etc. We don't do any of that! Every time it's been a free-for-all, and it always works out fine. People grab food, chit-chat, and meander through the piles, grabbing things that strike their fancy. We'll grab stuff for other girls, like "ooooh Emily, did you see this? This totally looks like you!" and when we have a substantial pile, head to one of the changing spots for a mini fashion show. Every year I walk away with at least a few new pieces, often things I maybe would never buy, but are fun to experiment with, since they were free! At the end of the swap, all the leftovers are bagged up and donated to a local center for victims of domestic abuse. They have a thrift store on-site where the patrons of the center can shop for free! This year, Maria's work was also hosting a professional clothing drive for Dress For Success, so all of the workplace clothing was donated to that. The clothes swap is always a highlight of the season for me. I get to offload my unused clothing, know that it's getting a new life either by one of my friends taking it or going to a good cause like the domestic abuse center, and go home with new-to-me pieces for free! Have you ever attended a clothes swap? Ever hosted one? I think it's a really amazing way to "shop" ethically and responsibly discard the clothes we no longer love. Plus, any excuse for a party is a good one in my book! ^^ Zelie enjoyed the swap too ;) Girlfriend found herself some sweet new boots! I've aways been a fan of ModCloth's cute clothes and affordable price points, and did a little experiment last week to see what kinds of ethical options they offer. Turns out, a ton! I was happily surprised to see 20+ pages of items when I searched "Made in the USA" on their site, including lots of their adorable basics, like this top that comes in lots of colors! I rounded up my top sixteen picks for you, below. It's so encouraging to see major stores like ModCloth, Nordstrom and even A Pea in the Pod offering more and more options made responsibly, right here in our own US of A. Gives me all the good feels. I ordered this top and can't wait for it to arrive, and I'm eying this dress for the winter. I think it would be great for a baby bump over leggings or tights, and could be easily dressed up or down, don't you think? Happy shopping! Happy Wednesday, friends!! I don't know about you, but I'm in the thick of figuring out my fall + winter outfits over here. Temperatures have been unseasonably warm in my part of the world, but I know they're going to get cool really soon and I'm excited about the transition to layers. Fall and winter is truly my favorite type of dressing! Now that I'm no longer nursing, dresses have been my jam. It's so hard to find nursing-friendly dresses, so I'm living it up in them until I do it all over again next summer :) Plus, dresses over leggings is a super easy way to look put together in the winter, especially when you're pregnant and already busting out of all your regular clothes (um, hand raised emoji over here. That showing-early-the-second-time-around thing is no joke!) Just throw leggings or tights on underneath and layer a cardigan over top and those short-sleeve and short length dresses are ready for the frigid temps! I rounded up twelve ethical dress options for fall + winter and linked them all below. They are all SO cute, I'm having a hard time deciding which I want to add to my closet, but I'm leaning towards the floral maxi. Which would you choose?